Over the past several years vacation home rentals have soared! And it’s no wonder why. Stays at hotels are often pricey, impersonal and cramped. Rental homes offer all the amenities of your own home and can easily accommodate large families. On the flip side, they also serve as stellar ways for families to make a bit of extra money during peak travel season. However, without a platform on which to advertise it can be difficult to get the word out about your home-away-from-home. 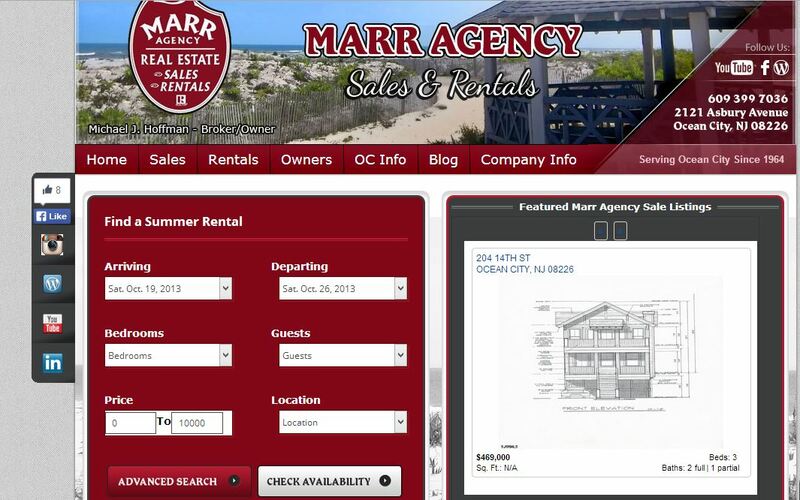 That’s why The Marr Agency tasked the experts at OC Designs Online with creating them a custom one-page web design to showcase their listings of fantastic vacation homes. Since contact is the name of the game, the site offers a multitude of ways to stay in touch in the header of the landing page. This includes Marr Agency’s physical address, phone number, and social media channels. A rider of social media plug ins takes up residence in the left sidebar, following the user as they scroll down the site and inviting them to connect via pintrest, youtube, linkedin and more. The template also makes the process of actually finding a rental a cinch. Plug in just a few key pieces of information including your arrival and departure date, location, number of guests and price point, to see tons of potential rentals fitting the bill. To the right, featured listings scroll across effectively advertising unique and popular properties. For those who are looking to merely get a general idea of the properties available for sale and in their budget, a quick search feature occupies the midsection just waiting to pull up listings to match the identified criteria. Establishing contact with an agent couldn’t be easier as our design experts have aptly included a feature allowing potential buyers to send in a direct message without ever having to leave the site. Next, by linking their blog posts to the home page, clients can easily get a sense of who the company is, what they’re about, and stay abreast of industry news. 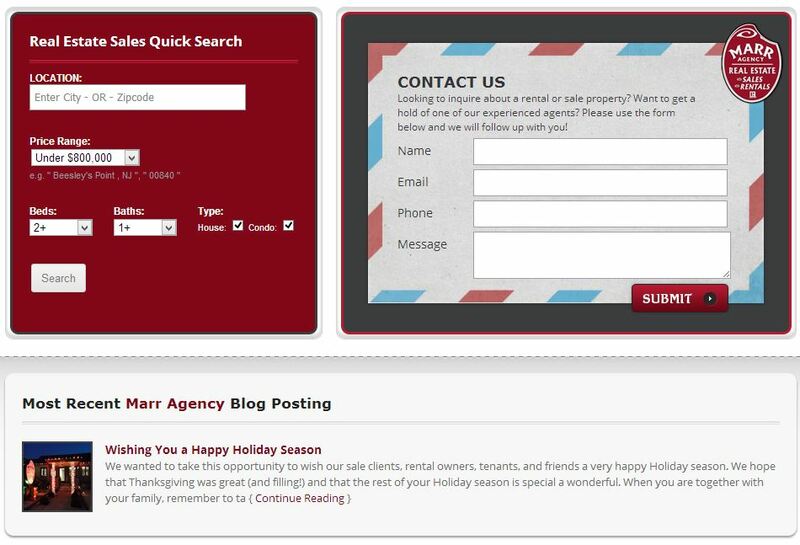 Finally, a custom footer offers customers easy access to a mini sitemap, contact information, ways to connect, and a sophisticated social media plug in so they can see who of their friends has visited and liked the agency. Are you looking for a web template that’s not only beautiful, but easy to customize? At OC Designs Online we are experts at crafting one-page web designs which can be easily tailored to drive site traffic! We invite you to browse our ever-growing portfolio and contact us today to request a free quote! We hope you’ll check us out on Twitter and follow us on Facebook—be sure to find us on Google+!